Travellers on the East Coast mainline will soon get free wireless internet access - thanks to a change in operator. Current firm GNER is set to make way for a new franchise operator in December, National Express, which already runs other train services including Gatwick Express and Central Trains. 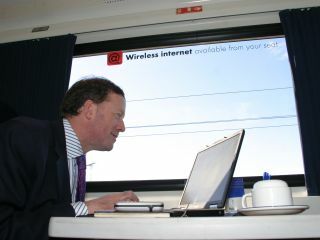 Travellers in GNER's first class carriages can currently access wireless internet for free; those in cattle class still have to pay. However, National Express has pledged to roll out free access to all carriages. GNER's scheme was pioneering at the time - it was only the second rail route in the world to offer full-spec Wi-Fi access. GNER lost the franchise because of financial trouble. Its parent company couldn't fund the £1.4 billion that National Express has pledged to pay the government under the new franchise. Instead, GNER had teamed up with Virgin and Stagecoach to launch the deal. Virgin also suffered a setback recently when it lost the CrossCountry franchise to Arriva. The operator change will occur in December, with the new franchise operating until 2015.